Rachel and Kristy are at Blossom Hall again and they go on a picnic. There they find Danielle the Daisy Fairy and they look for goblins. When they find them, they have the petal. Rachel and Kristy get turned into fairies and fly over to try to get the petal. It was on a rock. When the goblin made a hail stone storm only over the rock, one of the hail stones hit Danielle and she lost her wand. Then, they see a girl who says they can help to get the petal and the wand. The girl's name is Rebecca. She was super excited to meet a real fairy, but it was supposed to be Rachel and Kristy's secret. Rebecca takes out an umbrella from her backpack and covers the fairies. Rachel, Kristy and Danielle fly over to grab the wand and the petal. They get it and Danielle turns Rachel and Kristy back into girls now that she has her wand. 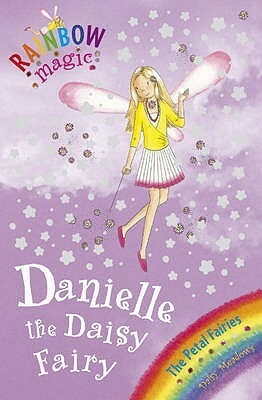 Book six in the The Petal Fairies series by the group of authors who call themselves Daisy Meadows. Their books are so formulaic, no wonder they've churned out more than a hundred of them. But our oldest loves them and gets more and more at the library every time. She's averaging one every day or every other day, so it'll still take many months before she exhausts the selections. While this is #6 in the "Petal Fairies" series, it was only #2 for my daughter and me. The plot is exactly the same as the previous one, and the climax was hardly as exciting. I think there are something like 24 books in this whole series--maybe even more. I think I'm in for some monotonous nightly reading, but at least my five-year-old daughter loves them! I finally read one title in this very popular series. It's a bit hard to imagine why they're so popular. We discussed them in our series Readers' Advisory meeting and agreed that from here readers can move to Disney Fairies and Rodda's Fairy Realm. My 2 year old loves me reading these books to her, she loves fairies. These books are for older than her but they make excellent rainy day books for me to read to her whilst cuddling up together on the sofa. As a Children's Librarian, I felt compelled to read this and expand my awareness of children's literature. I wasn't surprised by what I found - it's not terrible but there are far better options at this level. This was a great book. Otherwise known as:THISWASAGREATBOOK. Or:THIS WAS A GREAT BOOK. Daisy Meadows Georgie Ripper - Daisy Meadows is the pseudonym used for the four writers of the Rainbow Magic children's series: Narinder Dhami, Sue Bentley, Linda Chapman, and Sue Mongredien. Rainbow Magic features differing groups of fairies as main characters, including the Jewel fairies, Weather fairies, Pet fairies, Petal fairies, and Sporty fairies. Narinder Dhami was born in Wolverhampton, England on November 15, 1958. She received a degree in English from Birmingham University in 1980. After having taught in primary and secondary schools for several years she began to write full-time. Dhami has published many retellings of popular Disney stories and wrote the Animal Stars and Babes series, the latter about young British girls of Asian origin. She lives in Cambridge, England with her husband and cats. Sue Bentley was born in Northampton, England. She worked in a library after completing her education and began writing for children once her own began school. Bentley is the author of the Magic Kitten, Magic Puppy, and S Club series and lives in Northamptonshire. Linda Chapman has written over 50 children's fiction books, including the following series: My Secret Unicorn, Stardust, Not Quite a Mermaid, and Unicorn School. She lives in Leicestershire with her husband and daughters. Sue Mongredien was born in 1970 and grew up in Nottingham, England. She has published over 100 children's books, including the following series: The Adventures of Captain Pugwash, The Magic Key, Frightful Families, and Oliver Moon. She has also contributed many titles to the Sleepover Club series and written picture books. Mongredien created the Royal Ballet School Diaries under the pen name Alexandra Moss. She lives with her family in Bath, England.